She’ll find some really fun treasures which she’ll buy and take home with her. And as she is cleaning the vintage batter bowl that she bought, she will be inspired to make some muffins. So she’ll stir up some blueberry blossom muffin batter. When making those muffins she’ll realize she has some leftover buttermilk, which will remind her to package and freeze that leftover milk for good keeping. 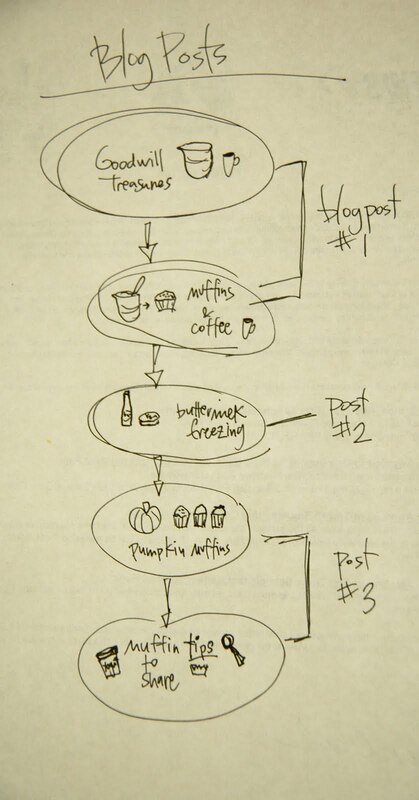 that she has learned along the way that have helped her muffins to improve over time. Thinking about these things will make her want to share them with all of her friends, which will inspire her to summon them all…. and chances are when she gathers her friends, she’s gonna want to take them to Goodwill for Half Price Saturday! So. This is a silly story version of what has been going on in my mind for the past couple of weeks as one thing has led to another. I have been pondering how to post everything that I want to share with you. And a run to Goodwill was the impetus for it all! 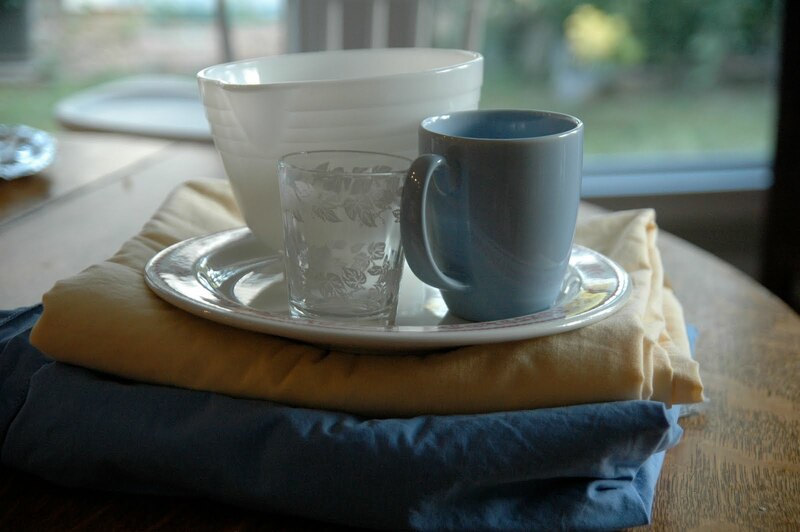 I adore thrift shops, muffins and cooking tips, and I have so much I want to tell you… the question has been how do I ration this into a manageable post? (Since I don’t think people hang around a blog for more than a couple of minutes at a time). What was I to do? I had to talk it out and then draw it out. want to share with you. Some people are not into thrift shopping, but I, myself, would choose digging through a bin of house wares at Goodwill over strolling through the racks at a mall department store any day! I love studying things and wondering who the former owner was, what life an item had before hanging out on this shelf, curious about what its next life could be. Repurposing treasures is a creative, therapeutic and life giving pursuit. and a couple of cotton sheets- one maize yellow, the other blue. The Blueberry Blossom Muffins are a variation of a Cooking Light magazine recipe I saved from a decade ago. I just recently rediscovered them. They are tasty and versatile. Preheat oven to 400 degrees. Place first 5 ingredients in a bowl. Combine and make a well in the center of the mixture. Combine buttermilk and next 5 ingredients in a bowl; add to flour mixture. Stir just until moist. 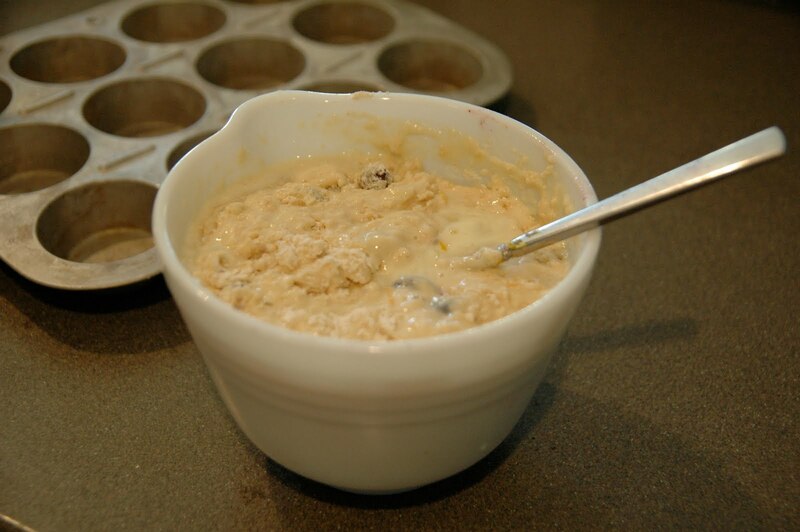 Spoon batter into 12 muffin cups coated with cooking spray. Sprinkle with sugar (I like to use Turbinado Sugar). Bake at 400 degrees for 18 minutes, or until lightly browned. Remove from pans; cool on a wire rack. When can I come have breakfast with you? Oh Karin, come over! 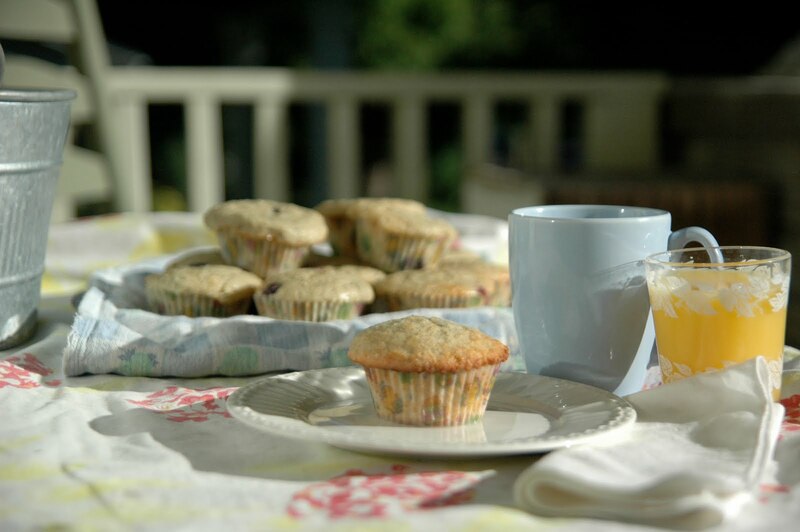 I will whip up some muffins, fruit and coffee…our favorites! love you!